A decade ago, I watched college students break out for small group work on hallway benches, on the floor in the corner, and standing at tables. I noticed that kindergartners could learn while standing, kneeling, huddling under a table, and even sitting in a wooden cubby. I saw my principal take a reading group to the office, where students loved to cram themselves beside the copier, between UPS boxes, and under a table. All this got me thinking: Why do we work at desks? Why stop students from wiggling? Could we purposefully educate students to recognize the locations they work best in? I began moving my first- and second-grade classroom to flexible seating with an old folding bench for kneeling and a sofa table for standing. These changes were free—I found the furniture in a storage closet. I created work nooks around the room so students could sit or lie on the carpet and work on a clipboard. I worked with our occupational therapist to utilize tools like T-stools and sensory wiggle cushions for all students. Recently, my principal committed to flexible seating with grants for standing desks, mushroom-shaped stools, adjustable-height folding tables, gaming rockers, and more. The questions I hear about flexible seating most often are: What about classroom management? Do you let students choose? Does it cause arguments? What about kids who can’t handle that kind of freedom? I use Responsive Classroom’s Interactive Modeling to teach students how to use flexible seating. With careful planning and clear expectations, most students will thrive in this type of classroom environment. Ideally, as they get older, elementary children will continue the process of determining what spaces work best for them. 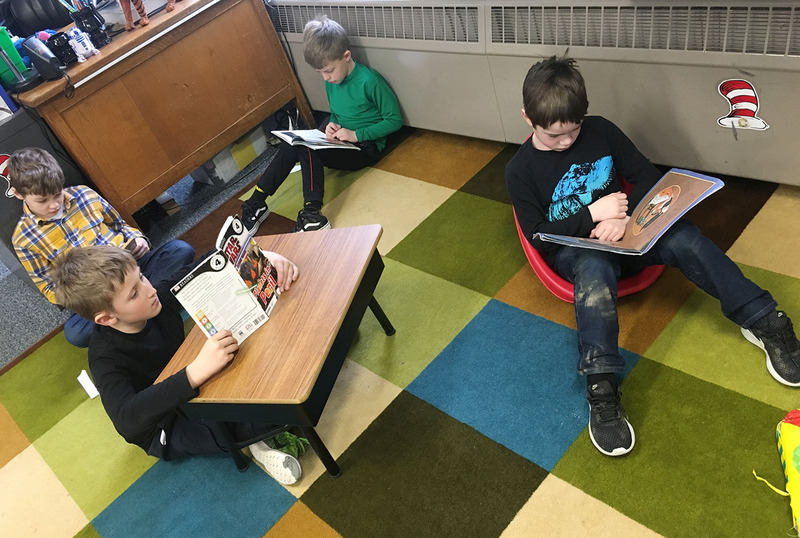 Flexible seating in the author’s classroom. The boy at right is using a gaming rocker. If we want students to succeed in a flexible environment, we need to be clear about expectations. I start the year creating flexible seating expectations with students to help with buy-in. (These are in addition to general classroom expectations.) My students understand that breakout seating is a privilege and must be used safely, respectfully, and responsibly, and—bottom line—must help them learn. If a seating choice distracts, I coach them and they try it again. If the seating still doesn’t work, they use traditional seating and try the flexible seating another time. In my room, students are assigned either a kneeling, sitting, or standing desk. These seating assignments change as needed. I also assign a work nook to each student on a weekly rotating basis. The nooks are places students can cram themselves into to read or work. Assigning spots prevents arguments about who got there first and expedites getting right to work. Productivity decreases after 20 minutes no matter the seating option, so students don’t typically work in the same option for very long. 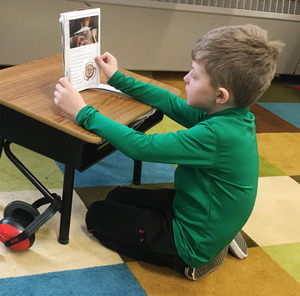 Sometimes I assign students to work in nooks, in the desk area (kneeling, sitting, or standing), and/or at group tables, depending on the activity. As the year progresses, students earn more freedom to make a preferred seating choice. Offering just one or two seating options may put your students in the same boat as traditional seating. Just as traditional seating doesn’t work for everyone, flexible seating may not either. I have a student who tries all the seating options but still prefers a chair and desk. I have other students that simply can’t use some of the options. For example, I have a student who can’t use the kneeling desk because it’s a bit too much freedom for him. He usually ends up getting hurt by a nearby stool or chair. Teaching students to choose seating is a process. A kneeling desk in the author’s classroom, created by removing the adjustable legs from a traditional desk. We work with our occupational therapist to support our students properly (pun intended). We make sure the tools are sized properly and not used for too long. Our OT recommends that students use exercise balls or T-stools for no more than 20 minutes. (Please check with your specialist to best meet the needs of your students.) Sensory wiggle cushions and wobble stools are used for longer, but are more effective if not used all day. Occupational therapy tools require preteaching so students understand that they’re tools, not toys, and must be used properly and safely. While some are assigned based on an Individualized Education Program, everyone gets to use them. We use the occupational therapy tools school-wide so everyone is on the same page and has the same expectations in every room, which of course helps with classroom management. 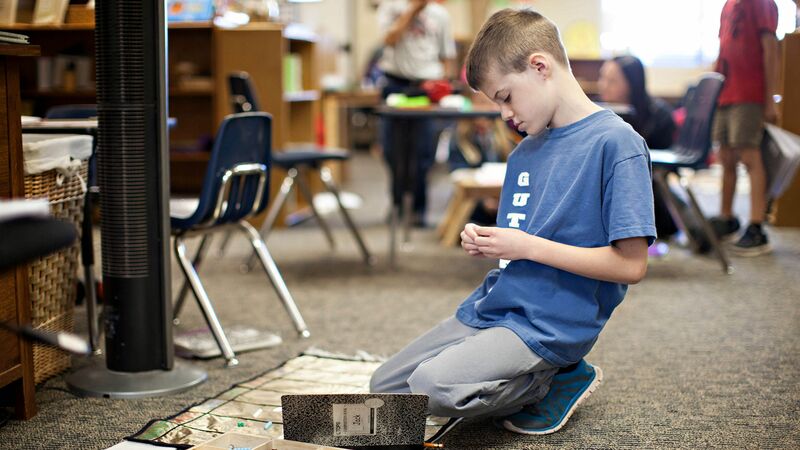 Intentional teaching in how to use flexible seating can create exciting options that work for everyone. Go ahead, give it a try—your students will surprise you with amazing productivity.